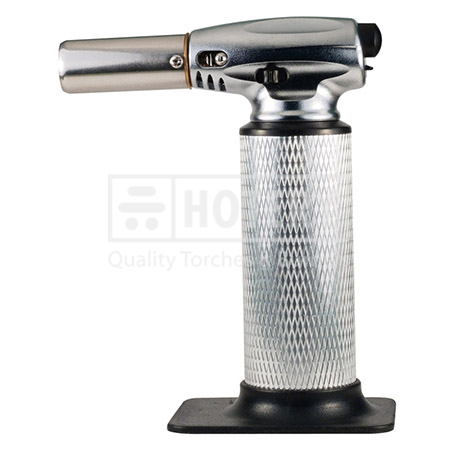 HOTERY PRODUCTS CORP. is the manufacturer, supplier and exporter of Butane Blow Torch, factory located in Taiwan. During the past years, we supply all over the world clients products with high quality products with reasonable prices. Both custom order and normal orders are available. We have a proven nucleus of professionals which makes us highly qualified to provide trading services to the highest standards. We have our roll of a team of well experienced and qualified professionals, capable to handle any requirements of the clients. If you want to know more,please feel free to contact us. Butane gas refillable prof. chef torch. alum. 1. Ergonomic body designs and materials. easy clean surface. 2. Idea for kitchen and restaurent. 3. Auto ignition with child proof safety switch. 4. Refillable lighter gas. fuel cap: 22.3g (=38.1ml). 5. Size 160x130x70mm (lxwxh). weight: 265g. 6. Operation temperature max to 1000 ℃(torch). 7. CPSC and CE approved. to offer than ever before and at the best prices.